But I did finally finish this piece. I had to. Some things just can’t be left undone. He asked me if it was too late to send a thank you card. I said “it’s never too late to say thank you. or to say I’m sorry-or I love you for that matter.” It’s really a gift to yourself. Family new and old gathered ’round here these past few days. As far as I am concerned, whoever graces our table at Thanksgiving is added to the list of “family”. My “family” is really akin to a crazy quilt. Made by hand of the finest and scrappiest of materials. Wouldn’t have it any other way. As far as this piece goes, it goes way back to 2007 when Karren Brito started a makiage challenge on flickr and I was learning discharge. It was just a practice piece. It resurfaced from time to time and I wondered about it here and there. At one point I decided to practice some quilting on it so I discharged some black seam binding with the arashi technique. 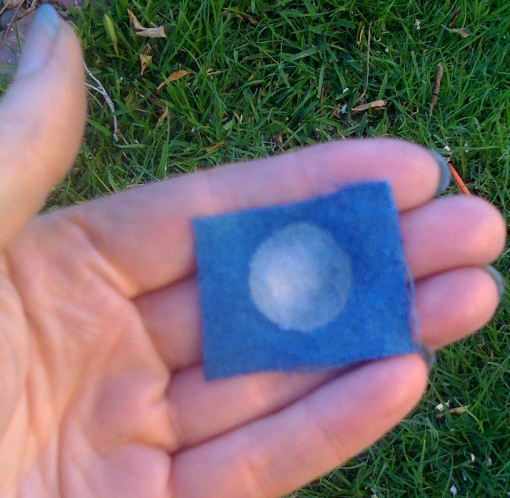 At some other point it resurfaced again and I started doing some hand stitching on it. 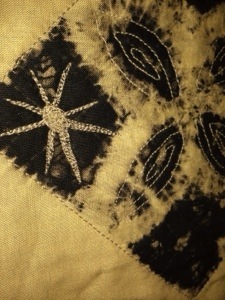 Eventually, the binding and the quilted part were reunited and half the binding was stitched on. A couple of years ago it surfaced again and I started hand finishing the binding. This past summer it made it’s way into my Yosemite bag and I finished the binding. Yesterday, I stitched on a couple of hangers to the back and cut a stick onto which to mount it. Finally. Done. Only took 5 years. Seems I’m in this for the long haul. -and finally it makes it’s way next week to San Francisco. As a reminder. Of many things. 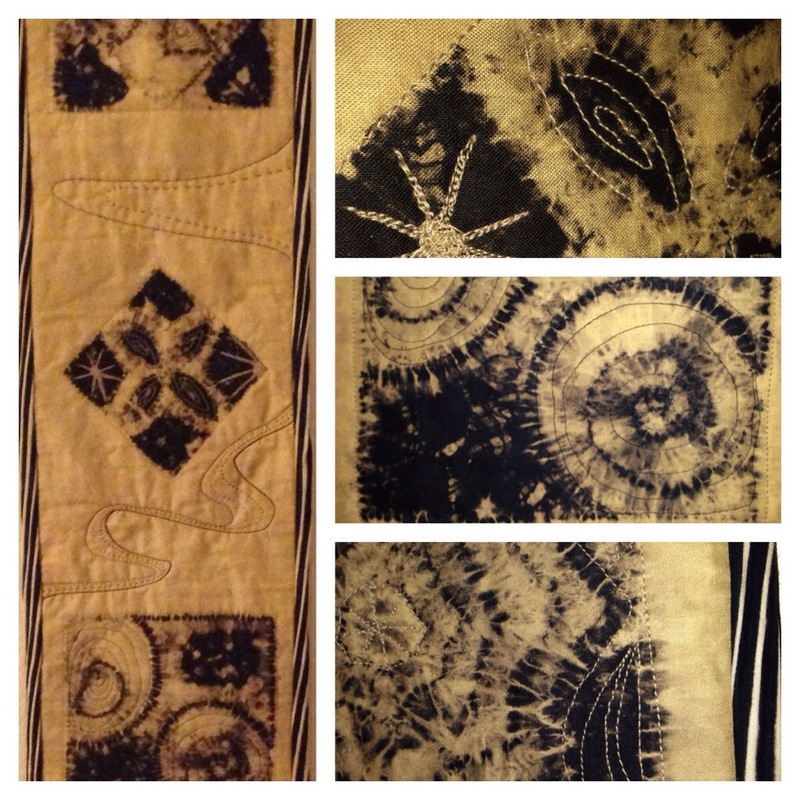 This entry was posted in experimenting, inspiration, makiage, shibori, slow cloth, textile therapy, wondering and tagged discharge, Karren Brito, makiage, shibori on November 30, 2013 by shiborigirl. It appears that Karren Brito’s book is out of print at the moment and a search around online shows some pretty crazy prices for obtaining a copy (up to over $200 ea. in some cases!) Her blog indicates that they are working on an electronic version but if you are like me you want a book you can drag around in the studio. There are still a few places online that haven’t jacked up the prices and seem to be taking orders for them. get one before they become a “collectors” item and you can’t afford one. 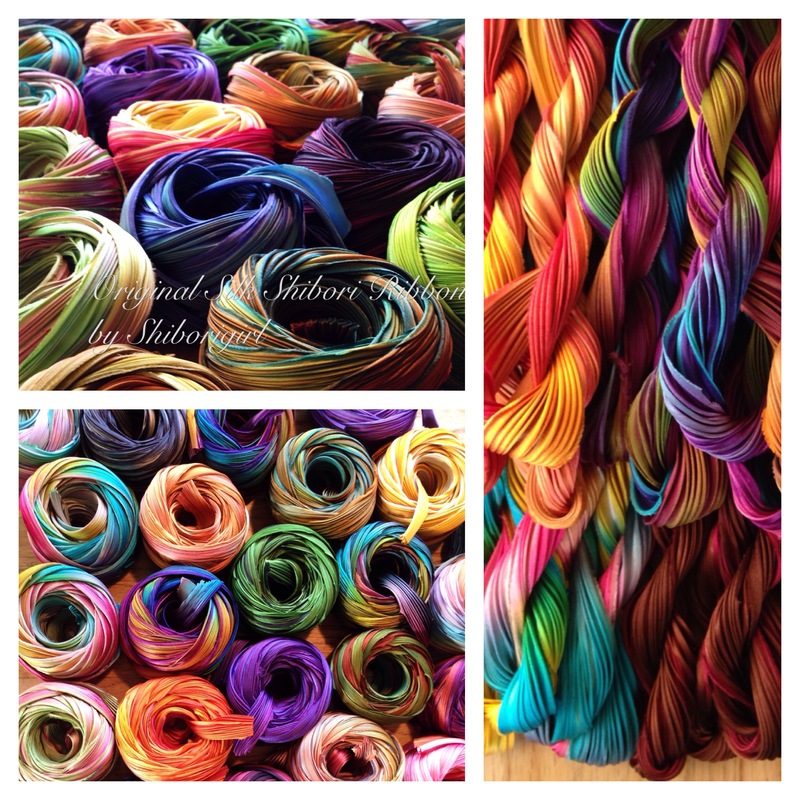 This entry was posted in about shibori and tagged book, Karren Brito, shibori on July 20, 2011 by shiborigirl.